I 1. Every true Christian has some experience with the problem of fear. 2. Fear is one of the adversary's most effective weapons in his attacks on the child of God. 3. Some of the most worthy characters in the Scriptures have wrestled with this problem. 4. The solution to this problem is presented most fully in the Scriptures. II. What Is the Proper Attitude Toward Fear? 1. It does not proceed from God (2 Tim. 1:7). 2. It cannot exist in the presence of love (1 John 4:18). 3. God encourages us not to fear (Isa. 41:10, 13). 4. Fear flourishes where faith is lacking (Mark 4:40). III. What Are the Several Aspects of the Problem? a. Nothing can separate us from God (Rom. 8:38, 39). b. God keeps us from falling (Jude 24). c. Christ saves to the uttermost (Heb. 7:25). d. We are secure in God's hand (John 10: 28, 29). a. God will provide a way of escape (1 Cor. 10:13). b. Christ is able to succor us (Heb. 2:18). c. Christ our High Priest understands (Heb. 4:15). a. God's angel encamps around us (Ps. 34:7). b. Fire and flood cannot harm us (Isa. 43:2). c. God protected Daniel, three Hebrews. Peter, Jacob (Dan. 3:24-27, 6:16-22; Acts 12:4-11; Gen. 32, 33; Ps. 91:10-12). a. God shall supply our needs (Phil. 4:19). b. The righteous will not beg (Ps. 37:25). c. The needs of our life will be provided (Matt. 6:25-34). When Elijah was sent to the brook Cher ith he knew the stream would dry up in time, but he went. And there God cared for him, even causing the ravens to supply his need. a. Christ has conquered death (1 Cor. 15: 54-57). When He rose from the tomb He broke its power. He holds the key that can open every grave. b. Blessed are the righteous dead (Rev. 14: 13). c. The dead in Christ will rise (1 Thess. 4: 15-17). d. This corruptible must put on incorruption at the last trump (1 Cor. 15:52-54). a. Accept the inevitable (2 Tim. 3:12). b. Trials have purpose (Rom. 5:3-5; James 1:12). c. God chastens His children (Heb. 12:5-11). a. His doom is assured (Gen. 3:15). b. He will be destroved (Rev. 20:10; Mai 4:1). c. He can be resisted (1 Peter 5:8, 9; Eph. 6:11). a. The righteousness of Christ guarantees freedom (Rom. 5:19-21). b. The Word gives power to overcome sin (1 John 3:7-9). c. The new birth fortifies against sin (John 3:7-9). d. The gospel frees from sin (Rom. 6:14-22). a. A sound mind is the gift of God (2 Tim. 1:7). b. Trust in God guarantees peace (Isa. 26:3). c. Love of God's law guarantees peace (Ps. 119:165). a. Christ did not fail (Isa. 42:4). b. All things possible through Christ (Phil. 4:13). c. Power and strength assured (Isa. 40:28-31). d. Divine help and support is promised (Isa. 41:10,13-15). IV. What Additional Means for Facing the Prob­lem of Fear Has God Given in the Scriptures? 1. The importance of faith (1 John 5:4, 5). 2. The power of the Word in its promises (2 Peter 1:4; Rom. 15:4). 3. The blessing of hope (Ps. 31:24; Rom. 15:13). 4. The significance of prayer (Luke 18:1; 1 Thess. 5:17). 5. The guarantee of God's love (Ps. 36:7; 1 John 3:1). 6. The need of the Christian's armor (Eph. 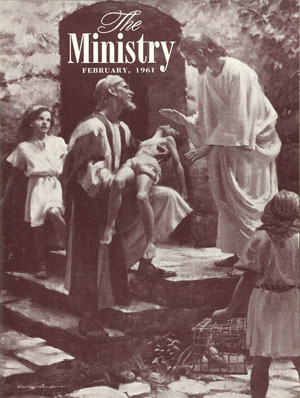 6: 10-18). 7. The promise of the Second Advent (Titus 2:13; John 14:1-3). 8. The security of Christ's friendship (John 15:15). 9. The danger of sin and transgression (Isa. 59:1, 2; Ps. 66:18). 10. The value of praise and thanksgiving (Acts 16: 25. 26). The knowledge of God's pity, care, and under­standing should inspire our constant trust (Ps. 103: 13-18). "Only the sense of God's presence can banish the fear that . . . would make life a burden. "— Education, p. 255. "God wrapped the jagged nerves and quivering body of his servant, the prophet, in a blanket of sleep. Later he touched him awake and again fed him. And when he was rested, God sent him for­ward to anoint two kings and a young prophet. "— 450 Stories From Life, p. 101. Let us remember that God's presence can chase away every fear, and if we trust Him and His prom­ises, He will use us mightily in His service.